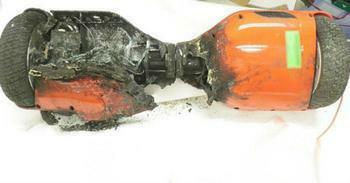 After sifting through 52 reports of hoverboard fires, the Consumer Product Safety Commission (CPSC) is declaring that all hoverboards lacking UL certification are unsafe and subject to seizure or recall. That apparently includes most hoverboards, since the CPSC itself said just a few weeks ago that no hoverboards had received the UL seal. For its part, UL said on Feb. 2 that it was ready to start certifying hoverboards. In a letter yesterday to importers, retailers, and manufacturers, the CPSC said that unapproved scooters pose "an unreasonable risk of fire" because of problems with the lithium-ion batteries that power the self-balancing boards. At least two homes and one car have been destroyed by hoverboard fires, the safety agency said. UL, formerly known as Underwriters Laboratories, says it will certify the boards using UL 2272, a standard that covers the electric drive train including the rechargeable battery and charger system combination for use in self-balancing scooters. “UL has been evaluating, testing, and certifying battery cells, modules, and packs as well as related battery chargers and power supplies as individual components for many years,” said Jeff Smidt, vice president and general manager for UL’s Energy and Power Technologies division. “With UL 2272, our expert science, research, and engineering teams have now developed the appropriate requirements and methodology to confidently evaluate and test the entire self-balancing scooter for electrical and fire-hazard safety as a system." Do not overcharge the board. Follow the manufacturer’s recommended charging times. If a fire does occur, leave the area and call 9-1-1. UL notes that most fire extinguishers are not suitable for use with battery chemical fires.